Will Ricky Gervais Ever Host The Golden Globes Again? While Ricky Gervais says he “had a blast” hosting the 69th Annual Golden Globe Awards this past Sunday night, the comedian is done for good with the job... or so it seems, based on recent comments. Gervais took to his blog this week to weigh in with his thoughts on the Golden Globes and share a picture of himself during what may be a backstage moment at the event. I've told my agent to never let me be persuaded to do it again though. It's like a parachute jump. You can only really enjoy it in retrospect when you realise you didn't die and it was quite an amazing thing to do. He goes on to attribute the crowd’s response this year to them either finally having figured out that his gags “only seemed rude and nasty but were actually not too scary at all”... or that they were just drunker. Perhaps it was a combination of both. In all likelihood, people were more prepared for the roasting this year, which might have made it seem like less of an ambush. Will he ever host again? I hope so, despite what he says now. His comparison about the parachute jump makes a lot of sense and relief may be a big part of the driving force behind his comments to not be persuaded to host again. Once that fades, he might reconsider returning. Or perhaps that's just wishful thinking on my part, as a fan. While Gervais’ celebrity ribbing may have seemed “controversial” at one time, it could be something viewers begin to expect from the event, which is usually a bit more laid back than the Oscars or the Emmys anyway. So, while third time might be a charm, hopefully it won't be the last time for the comedian. I like to think that come host-picking season, Gervais will once again be pursued and he'll decide to return, if not next year than at some point down the line. 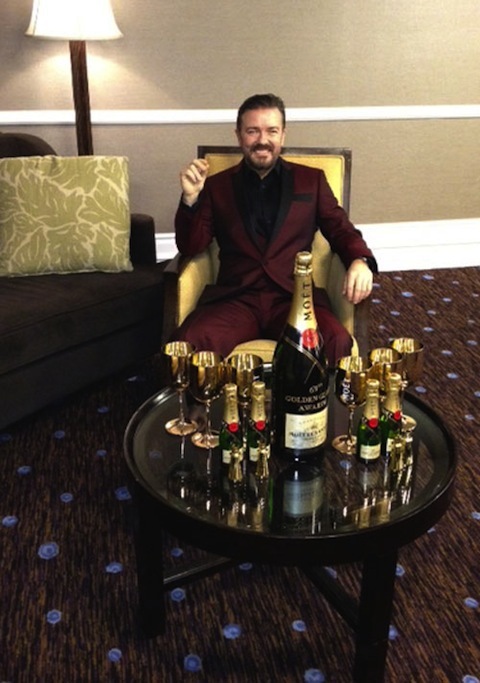 In the meantime, while we have months and months before we need to start speculating over next year’s Golden Globes, below is a photo that Gervais shared on his blog of himself in the maroon tux we saw him wearing during the ceremony last Sunday night. That’s a big bottle of champagne!